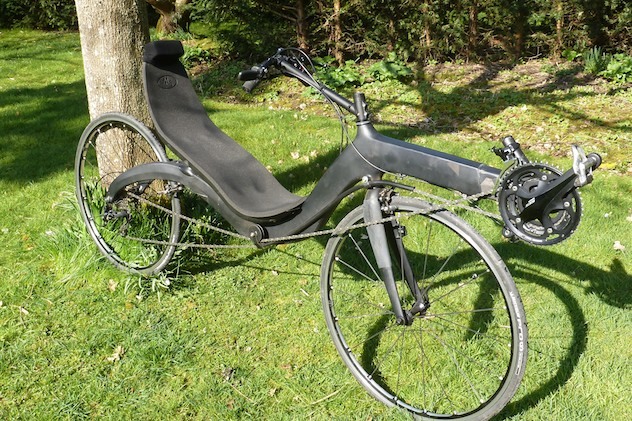 I recently had the pleasure of corresponding with Mike on the purchase of his first recumbent, intended to work around some neck pain he’s been having. It’s safe to say that he plunged in at the deep end with an M5 Carbon High Racer and I’ve been following his updates with interest as there has been something of a learning curve. At the end of last year my neck finally decided that my 25 years of riding a DF were probably at an end. Even on a turbo with the front wheel raised a foot to get the bars much higher than the saddle made no difference to the pins & needles in my arm & fingers. I got in touch with a young chap who I’d only met a couple of times on the club run but I was quite certain that he had dabbled with ‘bents. Sure enough his Optima Falcon was very kindly loaned & locked onto the turbo.I tried an hour session & incredibly there was no neck or arm pain at all. Google soon linked me up with Bikefix, Kevin at D-Tek & David at Laid Back Bikes & then onto Dave McC. The UK forums seemed very quiet but BROL was incredibly active. I was initially drawn to the Fujin & Low Baron purely on looks but was quite aware of the skittishness of the 20” front wheel from a few rides on the Falcon. Both Kevin & David pointed me in the direction of dual 700C’s & David was the one responsible for mentioning the M5 CHR. Although there was a demo at LBB it was quicker to go & see Bram in Holland than to journey to Edinburgh. A half hour test ride was enough to convince me to bite the bullet & a frameset was bought. I had read many times that you won’t know what a particular bike is really like until you’ve lived with it, warts & all, for about 6 months. The build was relatively straightforward, the only odd bit being the need for a Campag rear U brake for the front (modified with a longer through bolt). The spec was Sram XO 3×10 Gripshift, Rival rear mech, Shimano 105 triple chainset (50x39x30) which would allow for the use of a smaller “granny” if necessary, a 105 front mech to replace the XO which refused to stay put on the mounting post, a 12-27 cassette & Tektro rear dual pivot brake & minimalist levers. The worst part of the build was drilling the seat. There are two reinforced areas where the carbon is marginally thicker. When I left Bram’s I took what I thought was the most poignant dimension on the test bike ie from the front of the seat to the bottom bracket. The seat was set up, the holes drilled & then a sigh of relief to find that the end of the crank just missed the tyre by 10mm. I’m just 6’ but have a relatively long 34” inseam & thought this would have given me plenty of clearance at the front end. Without shifting the seat considerably more forwards (& so drilling into the unreinforced section) I don’t know how those with an inseam of much less than 34” can fit the CHR, unless opting for shortened cranks. And so to the first test ride. Let’s say that the bike unceremoniously dumped me far too often during slow speed manoeuvres. Road junctions were treated with dread, particularly 90’ right turns. I gave up trying to work out what was phasing me until I got home. On the bright side, a relatively flat route of 40 miles had resulted in a 18mph average without even breaking into a sweat. Initially I thought it was the dropped return chain which was causing the slow speed offs so I lifted the chain into a tube. A bit more investigation & the penny dropped; it was my feet clipping the tyre which was throwing me. My first reaction was “how daft is a design like that” but I am now learning that ‘bents are a series of compromises & that you can’t have everything. I have learned that starting off at junctions benefits from one-legged pedalling until under way. Also you’ve got to keep your feet out of the way when doing sharpish turns at speed. Climbing is another adventure. Remember that I’m still quite new to this type of bike & I’m trying hard to cope with the relative instability of slow speed climbing. At present the wobbles get to me at about 7mph. I know I have to relax my upper body & that with practice I’ll be able to spin at a much slower road speed. swapping the Michelin Pro 23mm rear for a 25mm. This just squeezes in so a 28mm will be out of the question. Using folded wet & dry as a series of shims for the boom (Bram’s advice). Tried XC shoes & SPD pedals for the first month but still had to stick on a non slip heel (a cutting from an old flip flop) so swapped back to road shoes with the same modification. Still not 100% slip proof particularly on wet roads. Finally solved the hydration & transport of tools, tubes, cape etc. by using a Decathlon Camelbak clone (3 litres of storage & 1 litre of liquid). The straps at the top were crossed over & stitched together so as to slip over the top of the seat & at the bottom new straps made of Velcro were stuck to the seat. The M5 carbon headrest sadly wouldn’t work when wearing a helmet. I’m now using a 2”x2”x6” section of foam Velcro’d to the cushion so as to just miss the bottom of the helmet. Finished off with a cover of a very stretchy black sock. My next tweak will be to try 150mm cranks as my knees are starting to ache. My ‘trailing’ knee is bent way over 90’ & I think this may be the cause of the discomfort. It’s worth a try. So, all in all, quite an eventful last 4 months. I still have a one minute re-learn curve before each ride & I still marvel at the manoeuvrability of a DF which, apart from its ability to cripple your neck, shoulders, arms, wrists, back & backside, is quite a brilliant design. I’ll be keeping in touch with Mike in the hopes of further updates and that he’ll get the starting and turning nailed. 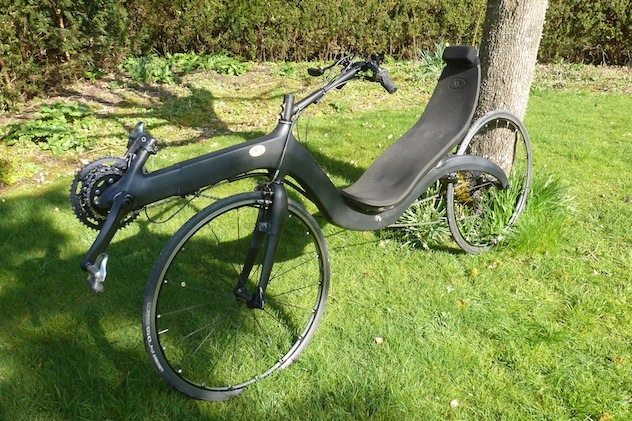 I’ve just started riding the Laid-Back-Bikes’ demo CHR with a view to a long-term review… watch this space. Try the Challenge Seiran, no head rest reqiured. Adjustable boom. 650 wheels;no heel clip. Fast.Choice of handle bars. I had a lot of trouble with spd shoe clips on my Seiran especially at junctions. Decided to go back to flat pedels. No panic with when removing foot from pedals at junctions and easier to start too. Thanks for writing about your M5. Tips on slow turns. – One tip on its own or a combination of some of these may assist mastering turning. Sit forward as much as possible – at least take your body weight off the seatback. Turn the corner without pedalling and outside foot down. Trail a little bit of rear brake when entering the turn, release on or about the apex. Unclip inside leg and hang it away from the bike while pedalling one legged. Straighten your fingers when turning, it will relax your grip on the bars. Note: foot/front wheel overlap also occurs on many DF bikes. It is not exclusive to bents. Thanks for the tip Brad! I’m riding the LB CHRS with 155s just now (Miche junior with an odd BCD). Just about to replace with a made up 155 set with 50/39 + chain guard. May be useful on the shipping chain front. Mike Burrows will drill out shorter cranks. Links from BHPC. Has to be right crank shape though. Other company that does short cranks is TA Vega – MetaBike use them. I got Mike Burrows to reduce the 170mm 105 (5703) triple to 150mm. He did a brilliant job & the cranks were back with me within 2 days. One crank very marginally intruded into the hollow section but not enough to be vaguely worried about. They certainly give lots more crank/tyre clearance & to be honest, I didn’t notice any difference after the first 5 minutes of my first try-out. What I did notice was being able to shorten the tiller quite a bit as my legs were so much less bent on the “up stroke”. Interesting read for me, Mike. I retired from age group triathlons in 1993 after sustaining a severe low back condition on a trip in Ethiopia. Actually raced a recumbent in an IHPV event in Milton Keynes in 1985 with some success. Had spine surgery in 2004 (unsuccessful) and in 2013 (titan rods & screws). 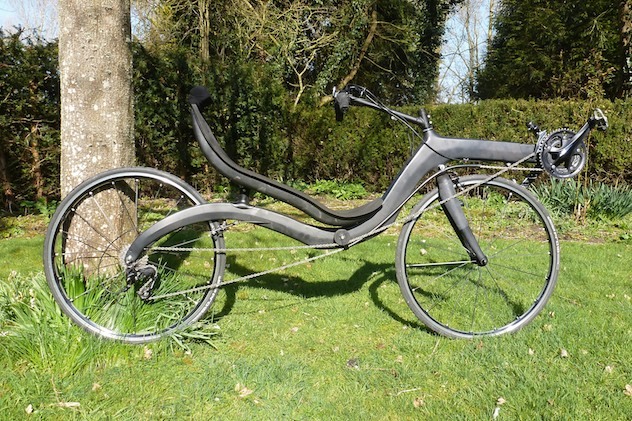 Bought a raptobike LR framekit in Holland in 2010, the seating position of which suited my back to a T, but had problems getting in and out of it. So, last September I picked up what probably was the last MR framekit from Arnold’s workshop in Amstelhoek (Raptobike now being sold to Elan). A few weeks ago I finished the build and have had six trips (two spills) so far. It’s racing equipped, but with 559 front (28mm tyre) & 571(23mm) rear wheel, which I think is very aestheticly pleasing (don’t know how to enclose a picture here) & slightly more aerodynamic. It’s much easier to ride along a straight line than the LR, I find. Being really low in muscle strength two years ago, I couldn’t click into my regular Look road pedals, but to my great relief I found Mavic Xzelliums (Time Xspresso) that stay open after releasing, which means stepping into them without effort (their cheapest model being lighter than Shimano’s Dura Ace!) They are also easy to disengage when turning your heel inwards. Knowing this makes your starts and stops much more relaxed. Still, I’ve soaked up all the tips about turning from an ealier comment, thanks! Short cranks sound good. Be interested to see how this changes how the M5 works. When I reduced my crank length without reducing the chainring sizes the gearing on my lowracer was too high. When I reduced the chainring sizes the same percentage as the crank reduction then the gearing was back to normal. I do pedal at a slightly higher cadence with the shortened cranks. I left the boom left the same as for longer cranks and that allows more foot clearance on the front wheel during tight slow turns. Six weeks with my CHR fitted with a Schlumf high speed drive is a learning curve. Find it a bit awkward with a fixed tiller stem so will look at an adjustable one from performer as a replacement. It’s a fast and incredibly stable bent especially going downhill (30 mph) so different than my Toxy ZR but love the way you can get power to the pedals for a fast turn of speed. Early days for me and couldn’t agree more with all your views on M5 CHR. MY M5 is new to me and haven’t had it on the road yet –it is at lease 7 years old –so finding this site is helping –maybe it will be set up right before it goes on the road ?